Every hunter knows how important it is to have a good hunting backpack that can keep his or her bow secure and properly stowed away while on a hunting expedition. 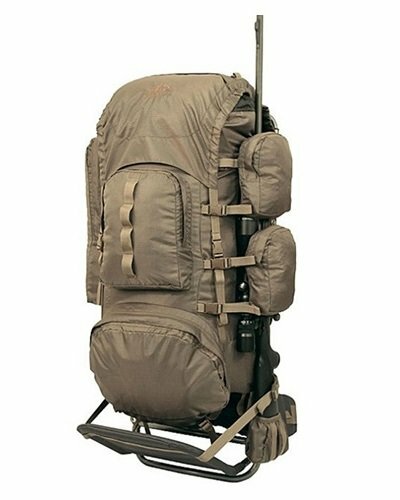 There are currently many bow packs on the market capable of doing that job perfectly well, and one such hunting backpack is the ALPS OutdoorZ Pursuit Hunting Back Pack, which holds the hunter’s bow in place keeping the hunter’s hands free as he or she treks through the fields or engages in activities such as glassing or climbing. It is imperative that hunters know that despite the Pursuit Backpack being made primarily for bow hunters, it can also perfectly hold a rifle. Below is an ALPS OutdoorZ Pursuit Hunting Back Pack review, which takes a detailed look into the major features and Pros and Cons of the ALPS OutdoorZ Pursuit Hunting Back Pack. Additionally, we shall also take a look at some of the most commonly asked questions with regards to the ability of the Pursuit Backpack. 1.12.1 Q. Who are the manufacturers of the ALPS OutdoorZ Pursuit Hunting Back Pack? 1.12.2 Q. Is the pack quiet? 1.12.3 Q. Does the backpack have an internal frame that provides stability? 1.12.4 Q. I have a pretty large waist size. Will the backpack’s waist strap fit? 1.12.5 Q. Can the pack carry a crossbow? 1.12.6 Q. Is the pack waterproof? 1.12.7 Q. Does the backpack cause problems with sight when the bow or rifle is strapped on? 1.12.8 Q. How many cubic inches is the backpack? 1.12.9 Q. Can one strap a sleeping bag to the backpack? 1.12.10 Q. How much does the backpack weigh? Despite the ALPS OutdoorZ Pursuit Hunting Back Pack not being waterproof, it comes with a blaze orange rain cover that can be found in a slip pocket at the bottom of the pack. This is very essential when you find yourself in a damp climate or when the weather suddenly turns foul and starts raining. In such conditions, the rain cover, which is durable and hundred percent waterproof, will keep both your pack and the gear inside the pack dry and safe. The rain cover can easily be stowed away when not in use. Another neat feature of the Pursuit Backpack is the drop-down pocket or holder it comes with, which is capable of securely accommodating a hunter’s bow, rifle or handgun. The drop-down weapon holder holds the hunter’s bow or rifle in such a way that it not only leaves the hands free to do other things but also allows the hunter easy access to the weapon whenever he or she wants to use it. The pack comes with an excellent hydration pocket that enables the hunter to easily and conveniently carry water hands-free in order to easily stay hydrated when they are in the field or on the go. With the ALPS OutdoorZ Pursuit Hunting Back Pack, the hunter enjoys a great level of comfort thanks to great features such as a torso range that is easily adjustable and a waist belt and a shoulder harness that are both well-padded. The backpack incorporates good extension lashing straps and an aluminum frame that work harmoniously together to aid the hunter to conveniently carry heavy loads. The backpack comes with well-padded waist belt and shoulder harness, which also contribute greatly in making the carrying of heavy loads easier since they support weight and efficiently distribute the load the hunter carries. Pack is durable and light. Pack can securely hold your bow and rifle, thereby allowing you to keep your hands free. Pack doesn’t make noise, which is important for concealing the hunter’s presence from the animals he or she is hunting. Comes with a rain cover that keeps the pack and your hunting gear dry during a downpour. Comes with a padded waist belt and shoulder harness for extra comfort. Comes with plenty of room and pockets, which gives the hunter the opportunity to easily carry a lot of extra gear. One can easily get access to his or her gear thanks to the pack’s organizational shelf pocket. There is a quiver holder on the right and left sides of the back. The pack is reasonably priced for all the great features that it comes along with. Pack itself is not waterproof. Q. Who are the manufacturers of the ALPS OutdoorZ Pursuit Hunting Back Pack? A. The backpack is manufactured by ALPS OutdoorZ, which is renowned for manufacturing high quality hunting packs and gear for several years now. Q. Is the pack quiet? A. The backpack is fairly quiet and therefore does not make noise as you walk to spook animals away. You can even get your equipment in an out of the pack without creating much noise to spook the animals that you are hunting. Q. Does the backpack have an internal frame that provides stability? A. The backpack comes with a flat metal piece in the back that gives it decent stability. Q. I have a pretty large waist size. Will the backpack’s waist strap fit? A. The waist straps can easily be adjusted to fit any waist size – whether small or large. Q. Can the pack carry a crossbow? A. Trying to get a crossbow into the pack will be quite challenging since it wasn’t built to carry a crossbow. Having said this, depending on the size of the crossbow, you can somehow use the numerous latches the pack comes with to attach the crossbow to the pack. Remember that the pack is built purposely to carry a bow or a rifle and not a crossbow! Q. Is the pack waterproof? A. While it is a great hunting backpack, it really isn’t waterproof, which is why it comes with a blaze orange rain cover that is waterproof. All you need to do is cover the pack with the waterproof rain cover whenever it is raining or snowing so that the bag and its content don’t get wet. Q. Does the backpack cause problems with sight when the bow or rifle is strapped on? A. The backpack is cleverly designed in such a way that when a bow or rifle is strapped on, the user has no problems with sights. Q. How many cubic inches is the backpack? A. The backpack is approximately 2700 cubic inches. Q. Can one strap a sleeping bag to the backpack? A. It will be very difficult strapping a sleeping bag to the pack since the manufacturers did not make a special provision for carrying a sleeping bag. Q. How much does the backpack weigh? A. It has an approximate weight of 4 lbs. In conclusion, the ALPS OutdoorZ Pursuit Hunting Back Pack is a good example of a feature-laden backpack that not only enhances the comfort of the hunter with a number of relevant features but can also make a day of hunting a lot easier and more successful. On top of all the great functionality that the backpack comes with, it is also pretty reasonably priced.